The all-new Sport Seat was designed for the daily driver. This seat maintains the stock look but provides you comfort like no stock seat can. For those of you who have worn out your stock seats or are simply looking for a more comfortable replacement, this is the seat for you. The Sport Seat is a direct bolt-in to most CJ and all YJ Jeeps and will fit in any other vehicle with Corbeau custom brackets. MUST be ordered in pairs (Quantity = 2) of seats. For single seat sales, please call for availability. 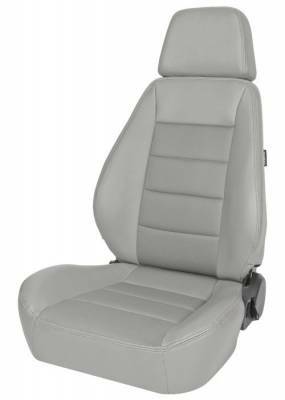 The Sport Seat is available in matching Jeep, black, tan, spice, and charcoal colors. The Sport Seat features a map pocket on the back of the seat and adjustable headrest that will adjust both forward and back and up and down. As a rule of thumb, the Sport Seat will fit up to a 40-42 inch waist. The Sport Seat is available in 100% leather, vinyl, cloth, vinyl/cloth, and neoprene materials.